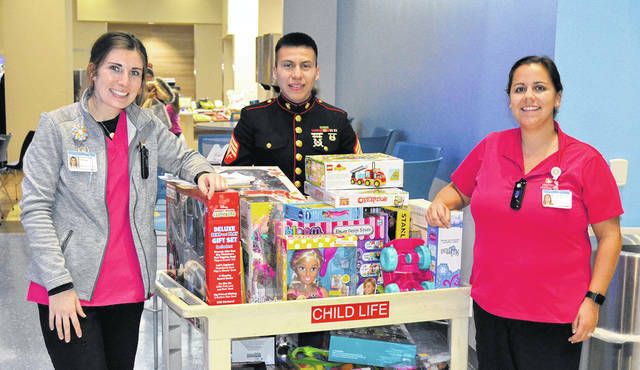 Sgt Miguel Contreras assists Children’s Medical Center Child Life Staff delivering toys to inpatient children. PAO Ray Girard, MVYM; Chaplain Tim Cahil, MVYM; GySgt Darrell Mumm, USMC (Toys 4 Tots Operation Director; YM/Sgt Jaelen Bobo, MVYM; and, Sgt Miquel Contreras, USMC, prepare to distribute toys at Childrens Medical Center. DAYTON — The United States Marine Corps is renowned for its ability to improvise, adapt, and overcome. Starting in November, trucks roll and toy donations are picked up for distribution to families. After that, any surplus is provided to worthy organizations. The objective is to assure these toys find a home with a child. 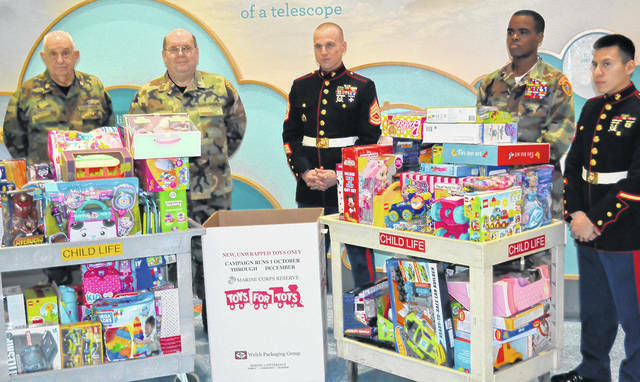 Therefore, on Monday, January 10th, a combined group from the United States Marine Corps and the Miami Valley Young Marines distributed toys to hospitalized children at Children’s Medical Center in Dayton. All were happy to participate in this event and the children were pleased to receive the toys as a belated Christmas gift. The Young Marines considered working with the Marine Corps and their visit to the children as a distinct privilege and an opportunity to reaffirm the principles of duty, loyalty, self-sacrifice, and community service. The Miami Valley Young Marines, who meet in Huber Heights, is the local unit of the U.S. Marine Corps’ official youth program (ages 8- to High School Senior).. The primary goal is to instill in each Young Marine the desire to become a life-long, productive, and contributing citizen in the community and to instill the core values of Leadership, Discipline, and Teamwork. A Miami Valley Young Marine Open house is conducted every Wednesday evening at 5:45 PM in the St. Peter Church basement, 6161 Chambersburg Road, in Huber Heights. Parents and children interested in learning more are invited. If you need more information, contact the Miami Valley Young Marines at (937) 701-8217, or see www.miamivalleyyoungmarines.com. The national web site is www.youngmarines.com.